It’s amazing how easy it is to simply grab your bike and head out the door during the summer months. Socks and shoes, shorts and a jersey, pop on your helmet and you’re good to go. Once winter shows up it’s a whole different scenario. It takes more time to prepare for a ride that will be comfortable to stay out on, rather than turn around and head home to the surrender of the television set. You can cheat the weather all you want to in the summer. Wear whatever you wish and within reason, it won’t be all that detrimental. Try that in the winter time and things can get pretty miserable. You can end up in a lot of trouble. 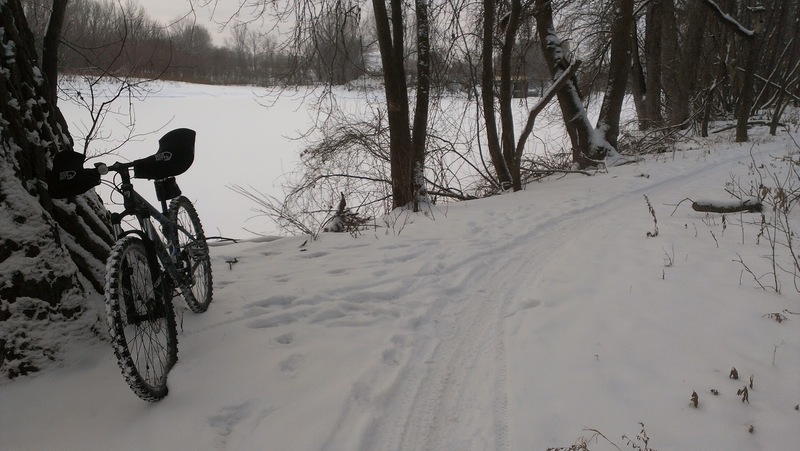 Fortunately, cold weather riding can be just as rewarding as it is in the warm months. 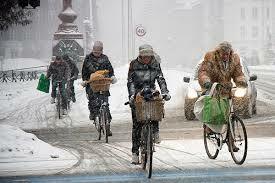 There are all sorts of cold weather cycling gear available that really change your outlook towards the “off season”. It’s too bad that Frodo and company didn’t have access to microfleece tights while on their way to Mordor. It would have made their journey a heck of a lot more enjoyable. Building a winter kit doesn’t have to break the bank. You can pick up a piece or two each year. Even with one or two items you’ll notice a difference when you ride. A good place to start would be with the buying of a pair of tights. You can buy regular tights which are really nothing more than your normal lycra riding shorts with legs. These are okay for slightly cool rides, but their window of usage is fairly short. The ones to buy are what are known as microfleeced tights. These are lycra tights that have a lining made out of very fine soft polarfleece. They are very warm, have a wide range of temperature usage from cool autumn or spring rides to downright cold winter days, and they wick sweat away from the skin remarkably well. You can also buy them with a water and windproof storm panel on the front of the thighs for extra protection. Tights are one of those items that’ll make you wonder how you ever got along without them. Long sleeved winter jerseys are similar to the tights. They are also microfleeced for extra warmth and wicking ability. Winter riding jackets are designed to cut the wind. Most of them go beyond being water resistant and are waterproof. They have taped seams to ensure that no moisture gets in. These jackets have extra long tails on them to keep your rear end from getting wet. The sleeves are cut longer as well. You’ll find extra reflective details for higher visibility in traffic. For the feet you can do a few things. Regular boots can be used with platform pedals. If you use clipless pedals there are winter cycling shoes that have extra cold and wet protection. 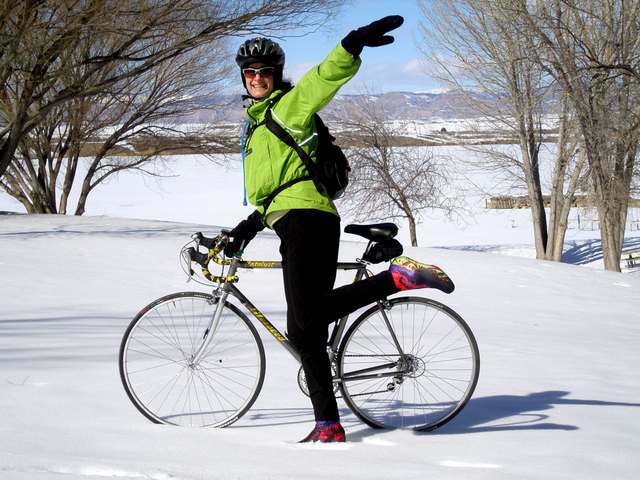 For normal cycling shoes, you can use neoprene booties or shoe covers to help keep your feet warm and dry. If you want the minimum, there are toe covers that go over the fronts of your shoes. Hands are simple. There is a wide variety of winter cycling gloves available. Most gloves can be worn in temperatures that are colder than what the tag recommends. 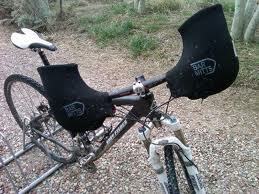 A relatively new item that is gaining in popularity, especially with the fatbike crowd, is the Bar Mitt. These are neoprene hand sleeves that attach to the handlebars of your bike, over your grips and levers. These allow for extra warmth and prevent wind from getting inside your sleeves. They let you wear a lighter glove for less clumsy shifting. Bar Mitts are great for hybrid riders who ride open railtrail too. When it comes to keeping your head warm, there are three key items that work amazingly well. 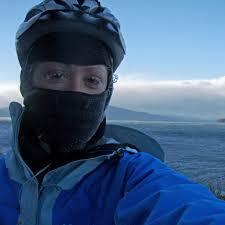 Many riders and runners use microfleece lined beanies or full balaclavas. These keep your head warm like a toque, but still allow a helmet to fit over them. One of the best items out there is a helmet cover. These are made of lycra with a rubberized lining. They stretch over your helmet and effectively block the wind and moisture from coming through the holes. They can be used by themselves but for the best experience, pair one with a beanie or balaclava. Quite often I like to walk around our shop and simply look at the stuff we have in here. I like to try and gain a “customer’s eye view” of what we have and what the industry is offering to us all. It’s been a while since I’ve seen so many changes in such a short space of time. We don’t just have road bikes. We have different kinds of road bikes. Ones for racing, ones for recreational sport riding, ones for the dirt tracks of cyclocross, ones for the rebirth of cycle touring (hallelujah!) and some for something called “gravel grinding”. We don’t just have mountain bikes. We have race geometry and trail geometry. We have fatbikes, cross country bikes, downhill bikes and dirt jumpers. These categories can be further broken down into sub categories such as enduro and trials. Sticking with mountain bikes, if you’ve gone shopping lately (or spent any amount of time researching on the internet) you’ll notice that there is a wheel war going on. We have the last gasp of 26″, the older “new” of 29″ and 29+”, and the new kid on the block (although not really new – just repurposed), 27.5″, or 650b, depending on whether you speak metric or imperial. Hang onto your helmets, because next year you’ll also be seeing 27.5+”. Add in fatbikes (which use 26″ wheels) and the party is complete. Isn’t it fun? In fact, it’s really not too bad at all. Bear in mind that everyone has their opinion, including me. In the end you’ll have to decide which wheel is best for you, yourself. I’ve found that these days it really helps to have an open mind concerning all of this. I’ll try to share some of what I know and have experienced. Let’s start with 26″ wheels. We spent a ton of time on this wheel size. Thousands of hours ripping thousands of kilometers of singletrack. There are many mountain bikers, myself included, that still own bikes that use this light, nimble wheel size. This all came about because of something involving Gary Fisher and The Birth Of Mountain Biking. There were these outdoors-ey types in California that were taking old balloon tired Schwinns and riding them offroad. Through trial and error they replaced and redesigned every part on the bikes….. except for the 26″ wheels. They remained a constant, rightly or wrongly. Mr Fisher was never really happy with the limitations of the 26er. They easily lost momentum over rough ground, they weren’t exactly comfortable (until Paul Turner invented Rock Shox suspension) and the rolling resistance versus traction was always an issue. Warp to the year 2000. Gary Fisher finally does something about the 26er’s shortcomings and invents a mountain bike with 700c wheels. 28.5″ in imperial measurement. He decides that it would be cooler to round it up and call it a 29″ wheel. This new wheel literally changed mountain bike racing overnight. If you didn’t have one of these you might as well have stayed home. 29ers are very fast. They really hold their momentum over rough ground and roll forever without scrubbing a lot of speed. Since the wheel diameter is larger, the wheels don’t drop into all of the bumps and hollows along the trail surface, making for a much smoother ride. Adding to this, since there is more tire contact with the ground, and the bottom bracket is lower in relation to the wheel axles, you can ride with much more control. This wheel size is the best solution for people who like to race mountain bikes or ride very fast due to the higher amount of speed, momentum and control. Commuters and rail trail riders also like this wheel size because of it’s superior comfort and ability to coast easier. So, this new 27.5″ (650b) wheel. It’s nothing new when it comes to bicycles. Triathletes and mega high mileage randonneur cyclists have been using this size for a very long time. For several decades in fact. It’s application towards offroad riding is relatively new. In short, I find that it really isn’t fair game to compare 27.5″ wheels to 29″. The bigger wheel will always be smoother and faster. Instead, I like to think of the 27.5″ wheel as a fantastic improvement over the old 26″ platform. You get a light, tough, nimble wheel that provides improvements in traction, comfort, momentum, speed and control. Downhill riders have embraced this new wheel wholeheartedly. This wheel size will appeal to the offroad trail rider who really likes the “on the edge” feel of his trusty 26er, but wishes for more momentum over the rough stuff and more traction on those climbs. Fatbikes use 26″ wheels with 4″ or 5″ wide tires and big sidewalls. The overall diameter of this is roughly equal to a 29″ wheel. The new 27.5+ size uses a 27.5″ wheel with a 3″ wide tire and big sidewall. This also roughly equals 29″. This size will be a great “lite” alternative to a full blown fatbike for many people. The cool thing about fatbikes is that you can run any sized wheel in them. I’ve seen pictures of a fatbike with a set of redished cyclocross wheels in it. Any crazy thing you want.